I’m so excited this project is finally out in the world for all to see! I first met Al Lover when he performed at Far Out Fest in May 2018 and we became friends, hard and fast, starting with easily convincing him to join us at our unofficial after-party at the local goth night. I hand-drew the title cards and used risograph printed images to create the stop-motion animated sequences. I also worked with my crew in Labrys Light Show to create abstract layers reminiscent of the movements of sidewinder snakes. Channeling inspiration from the title “Static Snake Charmer”, we explore our connection to the Earth through a kind of hypnotism, tuning into the universal image of rebirth. This was the most amazing honor for me to appear in the 2018 Music issue of The East Nashvillian! In 2018, I did more interviews than ever and every one was a new and awkward learning experience for me. There’s a part of me that feels weird that the very last thought I express in this article is kind of negative - “I don’t dig that.” isn’t my proudest quote of all time - but the sentiment is true and that’s what counts. I feel like this article really summed up succinctly who I am (as much as a single page can, anyway). Thanks to Brittney McKenna for being a lovely interviewer and Travis Commeau and Natasha Colleran for making me feel so comfortable during the shoot in the white-hot heat and making me look pretty alright. The amount of people who have stopped me to look me in the eyes and tell me they loved the article has just touched my heart deeply. Read it on The East Nashvillian here. 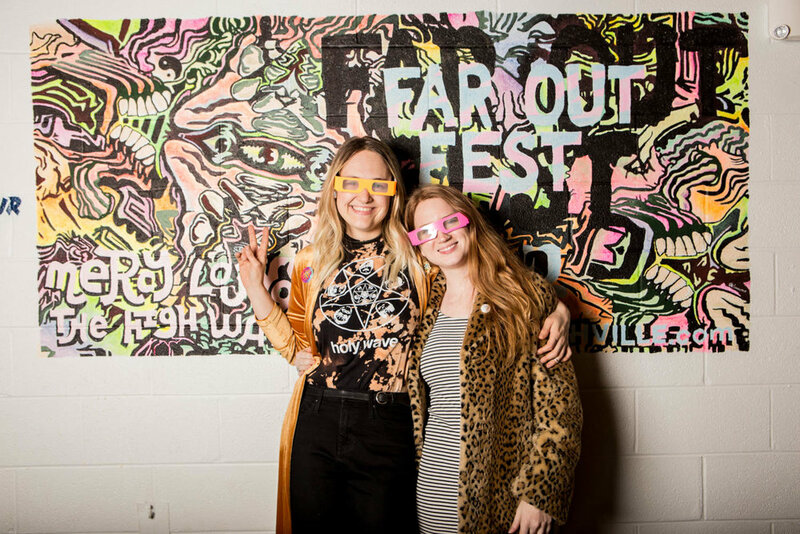 Far Out Fest Fierce Female Duo >>> HOMIE SPOTLIGHT! Here’s a wonderful interview with Brianne O’Neill & I about our psychedelic baby known as Far Out in the Nashville Scene as we gear up for a second installment this weekend! Thank you so much to Stephen Trageser for asking us to explain ourselves! Read it all over on their blog right HERE. Truly an honor to be asked to contribute to the 2017 Rock n’ Roll poll for Nashville Scene. You can read the whole thing right here and below you’ll find my complete list I sent them, because I think all of these people deserve a shoutout! Far Out Fest >>> BEST NEW FESTIVAL! Wow - this was a very affirming surprise to receive! Brianne and I were invited to the Nashville Scene’s Best of Nashville Awards where we learned our new psych fest creation Far Out Nashville had been named “Best New Festival” in it’s first year! After so much effort and a healthy amount of self-doubt, this was a touching little omen that we are headed in the right direction. You can read all about it on the Far Out Blog, enjoy! Well, now, this was a treat to be included in this article on Realtors who are giving back to their communities in Middle Tennessee through volunteering and donations. I have been a proud supporter and long-time volunteer of Youth Empowerment through Arts & Humanities / Tennessee Teens Rock Camps since 2010 and it was a no-brainer for me to decide to start putting 5% of my real estate sales commissions towards this cause. These camps have changed me fundamentally as a person and I can only IMAGINE how mind-blowing it must be for the teenaged campers! Thank you so kindly to Mr. Bill Lewis for interviewing me for this piece in The Tennessean and extra special thanks to Sophie Mason for suggesting me as a person to highlight. Truly an unexpected and cool honor! Read it right here!